All transactions are safe and secure with a reliable history in online purchasing behind each of our associates. 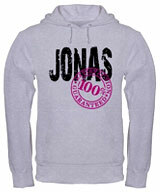 Buy the Jonas Sweatshirt to own Jonas Brothers clothing and merchandise. Everybody knows each new Jonas song and album means 100% satisfaction guaranteed. Whether you're listening to It's About Time, A Little Bit Longer, Lines, Vines and Trying Times, or their self titled album, you'll undoubtedly find yourself singing along to Jonas Brothers songs like "Burnin' Up", "Lovebug", "Fly With Me", "Paranoid" and numerous others. Wear this comfortable 100% Satisfaction Guaranteed Jonas Brothers hoodie sweatshirt as you bop your head to your favorite hits. In addition to the Jonas Sweatshirt above, browse the Jonas Brothers Clothing Gallery for more apparel like men's and women's clothes, kids shirts or hoodies.